BluePay is an industry-leading credit card processing company dedicated to connecting merchants with quick, easy and inclusive payment solutions and competitive processing rates. BluePay has pledged to donate .05% of their net revenue from each new merchant account for the first twelve months of processing to Komen Chicago. To date, they have donated over $30,000 to our organization. Click here. Stop by one of 34 Chicagoland Area locations and support Susan G. Komen Chicago for the month of October. Click here. 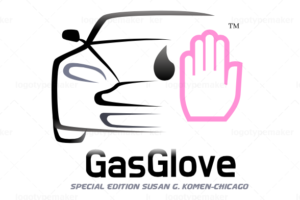 Donate your used car, van, truck, boat with a trailer, or recreational vehicle to help eliminate Breast Cancer to Susan G. Komen, seven days a week, 24 hours a day. The proceeds from the sale of our donated vehicles will fund collaborative and innovative breast cancer education, screening, treatment and support services locally and research on a national level. Fill out the form online by clicking here or call us at 1 (855) 566-3622. When you fill out the form select Il-Chicagoland Area Affiliate. $30 proceeds from each purchase go towards Susan G. Komen Chicago. 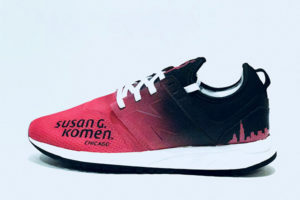 Custom designed 247 New Balance sneaker with ombre colors, Susan G. Komen Chicago logo and Chicago skyline on the back. This sneaker is designed to keep up with your demanding life on the move. Lightweight and flexible, it has a breathable mesh upper in combination with a unique bootie construction for an unbeatable fit that has major style. Spark your creativity with our creation of this classic shoe! Click here to order your shoes.